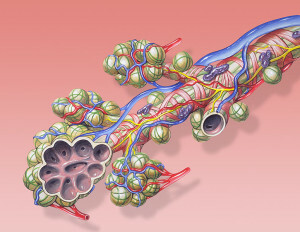 It is the border regions of the intestine, skin and lungs where the lining cells meet the outside world. They must respond to a vast amount of microbes and intense environmental factors. Conversations between lining cells, microbes and immune cells determine responses both healthy and unhealthy. Now it is found that neurons and glial cells are also very active in these border region conversations. Previous posts described elaborate communication between immune and nervous systems. A new frontier of communication is being described among five types of cells at barrier regions—microbes, lining cells, neurons, glia and immune cells. Neurons and immune cell communication is vital in many diseases including multiple sclerosis, inflammation, cancer and brain diseases. Recent research shows elaborate signaling at the lining cells in the gut, the lungs and the skin. Previous posts have elaborated on many aspects of the communication that occurs at these surfaces between microbes, immune cells and the lining cells. This post adds the new signaling including neurons. 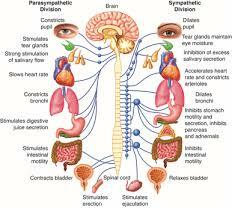 Both the nervous and immune system contribute to sensing or perceiving events in the environment. Social isolation is perceived by the both nervous and immune systems, which react cooperatively. These systems integrate all of signals and memories, both immune and neuronal, then have definite responses to new situations. Signals are from direct contact through complex synapses (see post on neuroinflammation) and through secreted signals including cytokines, neurotransmitters, peptides and special neurotrophin factors. Both immune cells and neurons have receptors for all of these signals. Immune cells come from the blood cell lineage (hematopoiesis) producing many stem cells (hematopoietic stem cells or HSCs) in bone marrow. Bone marrow has elaborate neuronal connections through the sympathetic nervous system. Signals from neurons impact on the blood stem cells, signaling with norepinephrine stimulating HSCs to move into blood providing more cells where ever needed. Circadian rhythms affect neurons particularly in times of stress. Abnormal neurons regulate blood cell cancers. Schwann glia cells cover peripheral sympathetic neurons with myelin. These glial cells sit in bone marrow and send immune type signals (cytokine TGF-b) that decrease HSC activity. New research shows that other signals from unknown sources control both HSCs and neurons. These signals include neurotrophic receptor RET (RET is a strange name somehow derived by abbreviating “rearranged during transfection”). RET signals control many functions of HSCs. The fact that so many functions are related to these signals means neurons and HSCs are co regulated by other cells in the environment. The gut local nervous system is the largest outside of the brain and is right near the largest immune centers in the body (Peyer’s Patch). RET is vital for the development of both the large gut nervous system and the large immune centers. Another vital signal is retinoic acid. There are questions about how much microbes and diet are the signals affecting this relationship between immune stem cells (HSCs) and neurons. This is because just after birth many neurons and blood cells are produced at the same time that microbes and dietary signals (antigens) are introduced. Other posts have discussed the influence of dietary signals (fiber, peptides, etc) on the development of specific immune cells. Now there is a question of these signals affecting neuronal systems as well. Neurons can live within specific organs outside of the brain or in special brain ganglia such as the sympathetic and parasympathetic nerves. Neurons associated with the gut are called enteric associated neurons or EAN or the enteric nervous system, which is colloquially called the “second brain”. This large second gut brain includes many sensory nerves, as well as centers that integrate these with inhibition by interneurons and then responses through motor neurons. Many neurons exist in large groups called plexus. The myenteric or Auerback plexus is between muscle layers. 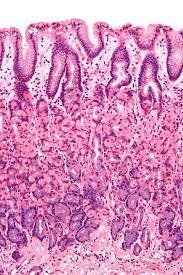 The Meissner plexus is just below the lining cell mucous layer. Both plexus have many immune cells surrounding them that are involved in elaborate communications. The major types of immune cells surrounding neurons and synapses in the gut are macrophages and mast cells. 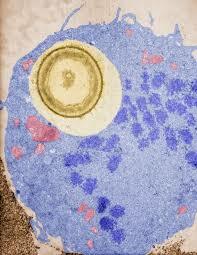 Macrophages are in the same family as brain microglia. Both macrophages and mast cells use many different neurotransmitters that are just being studied. 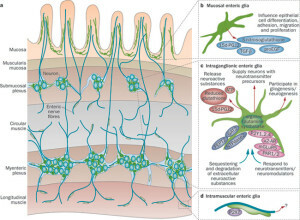 Another group of neurons are even closer to the mucosal layer (mucosal plexus) and are connected to a very large number of immune cells along with special cells called enteric glia that support neurons outside of the brain. The large amount of glial cells in the gut are called enteric glia. Enteric glia have many characteristics of astrocytes. They are really a version of astrocytes outside of the brain. Enteric glia are a vital part of the barrier communication and are a link between neurons and immune cells, just as astrocytes surround synapses in the brain and are a link to microglia. Enteric glia have some properties of immune cells in that they use more cytokine signals. They also present antigens and are part of inflammation responses. Enteric glia work with macrophages (relatives of microglia) but have some properties of microglia as well. They are also more mobile than brain astrocytes. Enteric glia have many of the same signals and receptors as astrocytes. 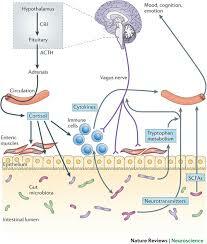 They support enteric neurons with trophic nourishing factors for both neurons and the epithelial lining cells. They influence the types of epithelial cells that are made by altering genetic networks. They are now seen to be critical for some dysfunction that causes disease. They stimulate a stronger barrier with increased adhesion between epithelial cells. 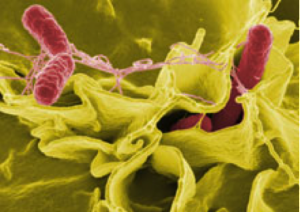 They defend the epithelial cells against dangerous microbes. They have the same vital roles as in the brain, but broadened to reflect the totally different environment of the gut. Enteric glia seem to have additional immune functions than astrocytes in the brain. There are few glia cells in the purely neuronal plexus. But, in the regions in between centers of neurons that are near basal lamina and in muscles, there are more glia than there are neurons. These glia have many immune receptors—CD45, T119, CD31, CD49b. Glia cells are vital in production and inhibition of inflammation. The complex signaling of these glia cells that are very prominent in the mucous layer are just being researched. 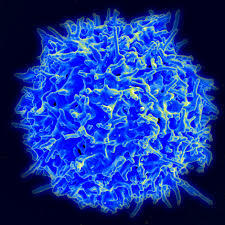 It is known that there is elaborate communication between immune cells and the glia. The brain is also part of the communication. Other posts have described the prominent gut brain connections involving the stress system of the hypothalamus-pituitary-adrenal (HPA). A major nerve connection is with the vagus nerve of the parasympathetic system. They connect with the myenteric plexus. There are several different connections in the colon including through the sacral plexus of the spinal cord. Peptides are secreted in this network with the HPA. Neuron cell bodies are below the lining cells and most immune cells are in the mucous region or near the border of the lining lamina propria. 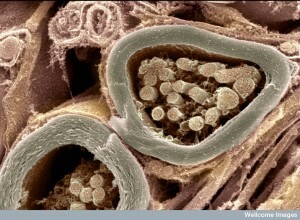 Fibers from the neurons go to all layers. Signals come from epithelial lining cells, immune cells or neuronal sensory fibers. There are many ways neurons combine with immune cells to form circuits. 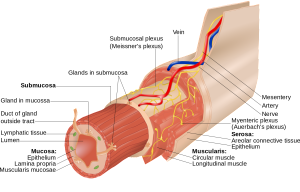 Fibers connect plexus and immune cells in the muscles or lamina. The vagus has bidirectional fibers. Some neurons travel to the spinal cord. Other circuits go through the spinal ganglia. New research techniques are able to find these new circuits and accumulations of immune cells that participate in communication. Circuits are now discovered through tracking ribosomes. New advanced microscopes using multiple photons can see neurons and immune cells in real tissue. These studies determine how normal situations occur and how microbes influence communications. Techniques actually image some of these circuits. Other techniques use tagged receptors associated with circuits. Also, research has tracked the development of cells from stem cells to pluripotent cells to tissue or immune cells. Sensing is different in immune cells and neurons. Neuronal receptors pick up damage to tissue and chemical disturbance. 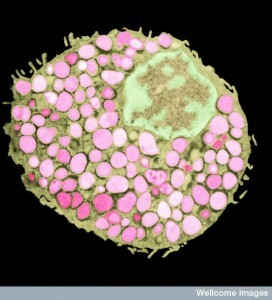 Immune cells recognize patterns of particles and respond. These senses complement each other at the barrier surfaces. Immune cell sensing involves more than receptors that recognize particular microbes through PAMPs or pathogen-associated molecular patterns. The can recognize damage to normal tissue through other receptors called DAMP or damage associated molecular patterns. These can include special heat shock proteins involved in responding to damage. 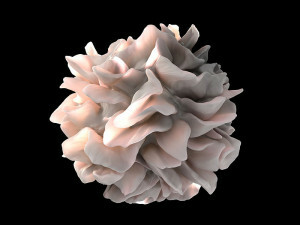 Another immune cell—dendritic cells—are essential for picking up these patterns. They provide sensory functions for the immune system in the gut. These cells sit in the juncture of the vast array of food and microbes in the lumen of the gut and the body cells starting with epithelial lining. Each tissue has many specialized dendritic cells that work with T cells and other immune cells to identify activity. In the gut these are Langerhans cells and other immune cells such as CD103. Epithelial cells themselves provide sensory functions, having many pattern recognition receptors as well. These epithelial cells are vital for all decision-making and communicate directly with neurons nearby about stress or damage. These lining cells produce special endocrine versions that secrete many hormones, factors and neurotransmitters. 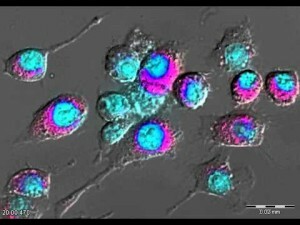 These are called entero chromaffin cells or ECs. They produce most of the serotonin in the entire body. They produce many neurotransmitters, many peptides including YY, GIP (gastric inhibitory peptide) and GLP (glucagon related peptide.) See post on peptide production and signaling in the gut. Peptide and hormonal signals regulate immune cell functions nearby. They stimulate neurons that affect motility of the gut. They send signals to the brain influencing function related to the gut. In the lungs, barrier cells also produce hormones and peptides. These are called pulmonary neuroendocrine cells PNECs and are stimulated by the particles that flow into the lungs and stimulate the epithelial cells. Peptides also stimulate immune cells. Signals from these cells as well as blood cells such as eosinophils trigger neurons that regulate the airways and their motility. Proteins from eosinophil immune cell granules trigger vagus nerve fibers. They signal with substance P and CGRP. These signals can attract more immune cells. The barrier cells in the genital tracts also have these epithelial-immune-neuro interactions but they are just being discovered. Studies have involved herpes virus that infects skin, mucosa and then travels in the neuron along microtubule transport to the central ganglia. They stay there and occasionally activate and travel back to the skin with new inflammation. Epithelial cells communications with immune cells about these events but they are just being researched. Signals are produced related to specific barrier environments. 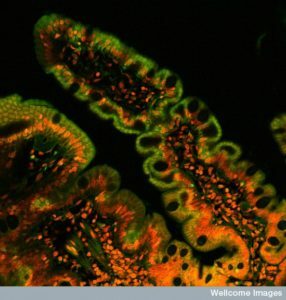 Some of the microbe signals in the gut produce serotonin in the colon. Specific dietary particles stimulate neurons at the gut barrier affecting gut motility. In the gut direct contact of neurons and gut epithelial cells (ECs) has been visualized through projections from the cells that touch. In the skin epithelial cells communicate with immune cells producing cytokine signals, which stimulates neuron sensory fibers experienced as itch. These use special receptors (TSLP or thymic stromal lymphopoietin). Neurons increase these receptors during an allergic response. Epithelial cells use signaling for many different functions. These include alterations of motility of gut and size of airways, regulation of food intake and control of the levels of energy for the tissues. 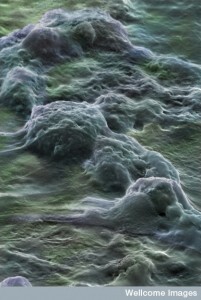 Fibers from neurons pick up direct signals at the barrier sites. These alarms in the lung come from neurons responding to microbe peptides and toxins. They pick up pain and communicate relevant to inflammation. Neurons have pattern recognition receptors (Toll like receptors TLRs). TLR7 in the skin stimulates itch. Neuronal pain was stimulated by TRPA1 as well as TLR7 at the same time. The large number of glial cells in the gut have many pattern receptors (TLR2, 3, 4, 7). Pattern receptors pick up CO2 by neurons that sense chemicals. Stress stimulates immune systems and cytokines stimulate brain and behavior. Vagal signals decrease macrophage behavior with less inflammation in gut. Recent research ties this to signals to and from the brain. Previous posts have described the effects of microbe products on anxiety. Cytokines (such as IL-17A) stimulated by immune cells respond to microbes and influence brain development in the fetus and behavior in animals. Intestinal glia cells pick up signals from microbes through pattern receptors (TLRs). Signals are involved in colitis and celiac disease. The same signals can disrupt the gut barrier. The glia associated with neurons sense microbe products and respond. Many different signals cause immune and neuronal responses and behavioral changes in animals. Noradrenaline suppresses immune responses. Pain fibers stimulate lung airways and gut when there are allergic reactions. These can cause coughing, closing of airways in lungs and nausea, diarrhea and vomiting in the gut. T helper cells produce IL-5, which stimulates pain fibers in the lungs, stimulating secretions of VIP (vasoactive intestinal peptide). This stimulates lymphocytes and then allergic lung responses. Another mechanism is from parasympathetic stimulation with eotaxin stimulating eosinophils to surround nerves in airways. In research without neurons in the lungs there are less allergic responses. Fibers from sensory neurons are also involved in regulating immune cells in psoriasis, arthritis and colitis. A substance that triggers an allergy (allergen) can produce IgE which triggers brain regions causing anxiety and specific animal behaviors of avoidance of other food as a protective maneuver. This same behavior can be produced in airway reactions where animals avoid the space where the allergen comes from. These occur because these allergen signals trigger receptors on immune mast cells that have receptors made of immune globulins. Mast cells then stimulate neurons. Mast cells have many interactions also in the skin and mucous regions in the gut as well as regions below the barrier and in the neuron plexus. Mast cells and neurons interact in skin, mucous membranes and in the gut below the mucous and in the myenteric plexus. Mast cells are a warehouse of already prepared vesicles filled with histamine, serotonin, TNF-α, and an enzyme tryptase related to both immune and neuronal stimulation. They also communicate with substance P and corticotropin releasing factor (CRH). Mast cells use neuronal circuits for communication such as the vagus and the ganglia of the spinal cord (dorsal root ganglia DRG). Mast cells respond to many environmental signals with toxins, capsaicin, and fats in allergens or in the parasites. This seems to be an ancient connection because in worms neurons react to microbe products or CO2 and the organism behavior changes. The behavior change is the same type of avoidance already mentioned. Serotonin signals with cellular stress in worms. At the barriers, special macrophages also have back and forth communication with neurons. In the intestine, macrophages signal with BMP-2 to enteric neurons and regulate their activity. Macrophages signal to regulate the peristaltic movements of the bowels. Special macrophages in the muscles of the gut are all around ganglia and neuronal cell bodies and can react to neuron activity. Special signals from these macrophages near neurons attracted specific microbes that joined into the communication. Microbes stimulated sympathetic neurons in the gut that then communicated with immune cells for protection from the microbes to avoid inflammation. 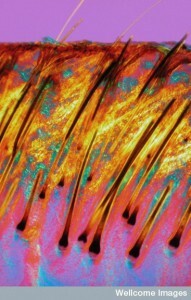 Back and forth signals among many cells is the basis of all physiology. Barrier regions are exposed to the most different types of cells and varied environments since it is where the body meets the outside world. In order to maintain order barriers have very complex communication between the epithelial lining cells, immune and blood cells, neurons and glia, and a vast number of different microbes. Communication among these intelligent cells maintains health and causes disease. How can we not be impressed by the complex lifestyle of these individual cells? This entry was posted in Neuronal Plasticity, Cellular Intelligence and tagged Barrier Regions regulate immune system, Neurons and glia part of communication at barrier regions, Neurons and immune signal in gut. Bookmark the permalink. It occurs to me that if these cells are communicating cooperatively, they are not only asking for instructions, they are asking for help. And if so, that’s how some of their regulatory processes are self-directed. The cells decide among themselves how to help each other! Yes, and they have no doubt evolved the proper strategic methods to solve these anticipated problems!